Carefully examine the pipes you can see, including those in your basement and crawl spaces, and behind cupboard doors (in your kitchen and bathrooms). Are the pipes insulated? Do they have switch-off valves? Are they located on outside or inside walls? Once you have determined the current location and condition of your pipes, shut-off valves and faucets, you can remedy some shortcomings. Pipes that are not on exterior walls will not freeze when your home’s heating system is working properly, so your first defense is regular furnace maintenance. Seal cracks and holes along your exterior walls and foundation to minimize the loss of heat. Keep the interior doors open—including any cupboard doors that hide pipes located along outside walls—to allow warm air to circulate. Insulate all your exposed pipes with Styrofoam sleeves, available at your local hardware store. If you cannot fully insulate your pipes, open the relevant faucets to allow a slow drip, which will relieve potential pressure from any ice build-up. When you are away from home, keep your thermostat at 50 degrees or above. All pipes in your crawl space should be insulated, with Styrofoam or electrical tape, which delivers slow steady heat to the wrapped pipe. If your crawl space is cold, you can install a simple lamp with an incandescent bulb, which emits most of the energy it draws as heat. The fixture can be regulated with a thermostat. Be sure all the pipes in your attic are protected with Styrofoam sleeves. If your attic isn’t well insulated, consider adding insulation now—studies show that pipes can freeze in uninsulated attics at about 20 degrees Fahrenheit, a common winter temperature in our region. If your outdoor pipes are not protected against freezing, you may experience flooding inside your home and/or in your garden, and potentially expensive repairs to your systems and landscaping. Fortunately, it isn’t hard to make exterior pipes winter ready. Remove your hoses and store them in a cool, dry area. Shut off the interior valves for the pipes leading to the faucet that connects to the hoses. Turn the faucet on and allow any remaining water to drain out. You can also slip a foam cover over the faucet for extra protection. Shut off the water supply to your irrigation system. Contact your sprinkler system company to blow out your system’s supply pipes for the winter. Check to see that the system’s automatic controllers are properly shut down. Make sure the shut-off valve and any above-ground piping is wrapped in insulation. What Should You Do if a Pipe Does Freeze? If a pipe is frozen but not burst, first turn off the water source. Then you can gently thaw the water with a hair blower or electrical tape, beginning at the faucet and working back. If a pipe that has frozen shows cracks or signs of leaking, call your plumber immediately. As winter sets in, periodically check your plumbing systems for leaks or other signs of freezing. And always ask a trusted neighbor, friend or relative to periodically check on your household and property if you are away for more than a few days. 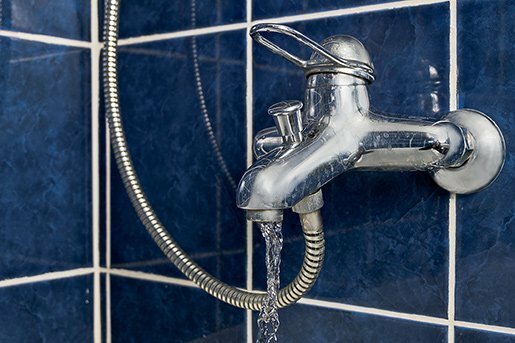 Be sure to let them know how to contact your plumber if they see signs of trouble.